After over 5 years in business, new website with green approach is launched this month. Palos Park, IL ( PRWEB ) September 12, 2008 -- Matting-Experts unveiled a redesigned website with more features and an expanded product line. Celebrating 5 years in business, president and CEO Rocky Stevens changed the website format from essentially all static images to the more modern and user-friendly shopping cart software from Volusion, Inc. The bold, freshly designed site http://www.mattingexperts.com provides expanded information about the products as well as 13 new manufacturers. Customers will find everything from yoga/Pilates mats to snow melting outdoor mats . All types of industry as well as residential consumers will find something to meet their matting needs. The broad range of matting products represents a "pick-of-the-crop" selection. Online shopping is in an easily accessible format. "I loved all the helpful photos" said Sarah Johnston, administrative assistant, M & R Lighting, "seeing the products in such detail made selecting the right mat easy." Among the main features of the new website are improved navigation, multiple images for each product and helpful tips on selecting appropriate mats for specific applications. 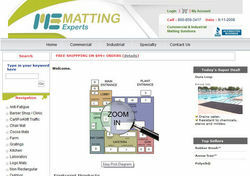 For example, the front page of the site includes " Easy Mat Find ", a diagram of a typical business facility. "It was really neat to look at all the play mats and other products I never knew existed!" said Catherine Saponaro, leasing agent. Customers can easily click on the various sections of the diagram to find a range of commercial mats , industrial mats , or even specialty mats. The new software being used adds many improvements to the old site. Not only is the look and feel more professional and visually appealing, there are numerous high-tech features supporting the store on the administrative side. One example of this is the ability for the program to calculate shipping costs from 15 manufacturing facilities located all over the U.S. with different weights and delivery destinations and provide that information to the customer before final checkout. In addition, small photos of items placed in the customer shopping carts ease the process of reviewing before final check-out. The appeal of Internet shopping as a highly visual experience is fully utilized on this dynamic site. While the site takes care of its business with professionalism, the articles and other site verbiage are not stiff. The message being conveyed is that shopping for and buying a mat, no matter the application, need not be a chore.